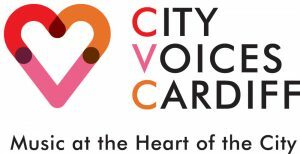 Since debuting at St David’s Hall in 2013 City Voices Cardiff have delighted audiences with concerts offering a wide range of music. They celebrated their 5th Birthday in 2013 and explored the music of Disney in WHEN YOU WISH in 2015. In 2016 they sang the musicals in their ENCORE concert and last year they went back to cinematic songs with LET’S GO TO THE MOVIES 2. So what can you expect from their 10th Anniversary Concert? 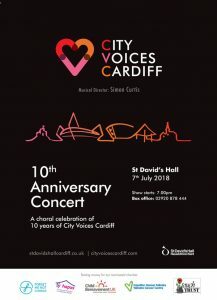 Well the choir have chosen their favourite songs from the last 10 years to present a perfect celebration of what City Voices Cardiff does best – their ‘Greatest Hits – so far!’ – for want of a better title. Alongside the normal mix of songs from stage and screen you’ll hear songs by Radiohead, Coldplay and Lady Ga Ga. Add some Eric Whitacre and Morten Lauridsen and you’ve really got something for everyone – a veritable potpourri of musical genres and styles. For their 10th Anniversary year the choir have decided to fundraise again for their previous nominated charities – Touch Trust, Velindre Cancer Centre, The Forget-Me-Not Chorus, Ty Hapus and Child Bereavement UK. The raffle and retiring collection from this concert will be going towards their fundraising efforts for these wonderful organisations.